Yes, this is the last lot of houses. 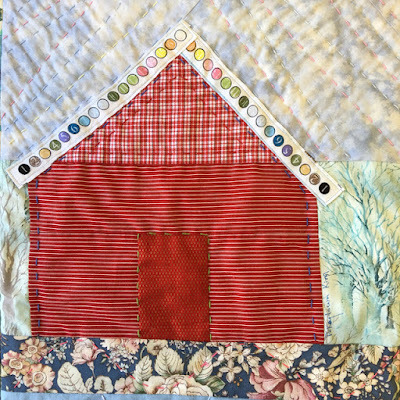 I'm sure you've seen by now why I've shown all the houses before showing the quilt. 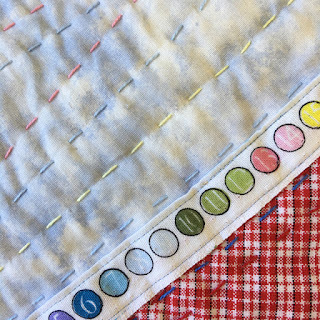 All the little details and fun fabric choices don't show as well in photos of the full quilt and they're too special to be overlooked. Anyway, there's quite a few houses to visit today so without further ado let's get on our way and have a look. 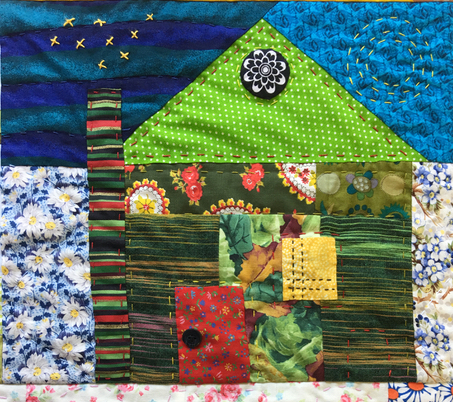 Kelly from Pinkadot Quilts sent a block that had a giant blue mountain daisy in it, daisies in the sky and ric rac trim along the roof. I love that it's so sunny and happy. Cameras have certainly improved since I took this photo The colour is a quite wrong but I wanted to post a before photo of the block that Karen from Sewing Tales / @karens_photos sent. It's hard to tell the scale of the blocks but this was by far the biggest. She left lots of space around the house in case I needed to trim it to make it fit. But instead of trimming it I added a flower to echo the flower in Kelly's block. I couldn't resist adding some colourful bubbles as a continuation of the fun spot fabric in the windows. Karen made a second block. A grand three story mansion!! I wish real houses had paisly and spot exteriors. 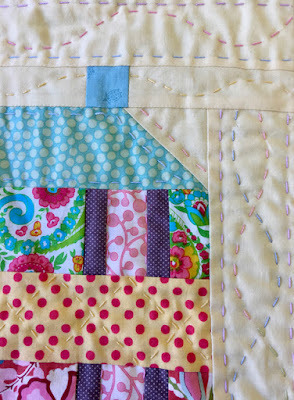 I had fun with lots of quilting in different pastel perle8 thread. 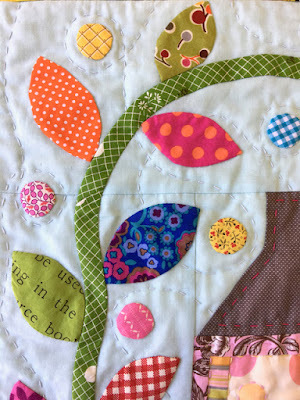 Beth from Love Laugh Quilt. made a blocks with a nighttime sky. I love the sparks coming out of the chimney. You just know it would be warm and cosy in this friendly home. 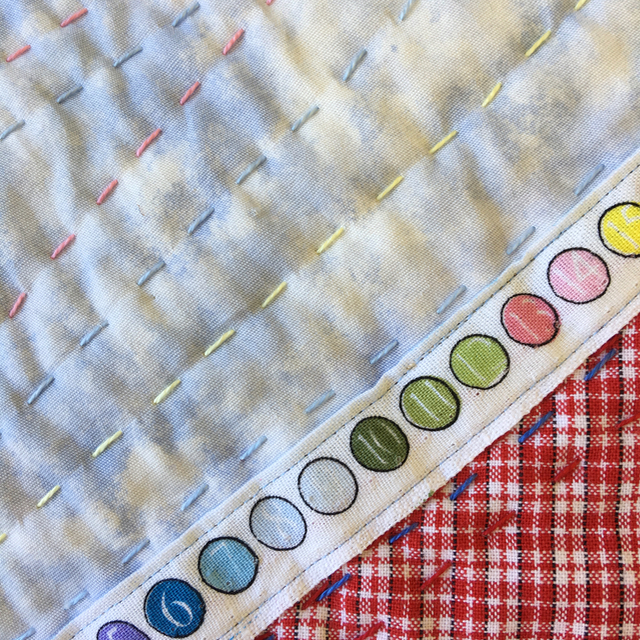 My quilting needle led me to quilt a glowing moon. Now Beth used to organise house block swaps. Participants would send in house blocks and then Beth would pick several winners to receive a bunch of blocks. I was a lucky winner so it meant even more houses for my quilt. Some of the makers of these blocks had signed the block so I know who made them. 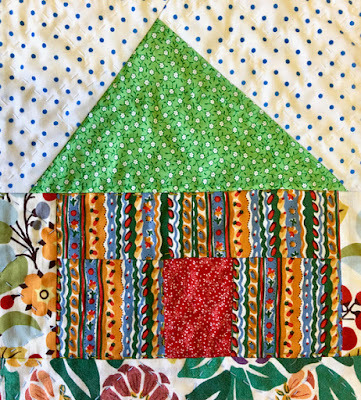 I love her selvedge roof. 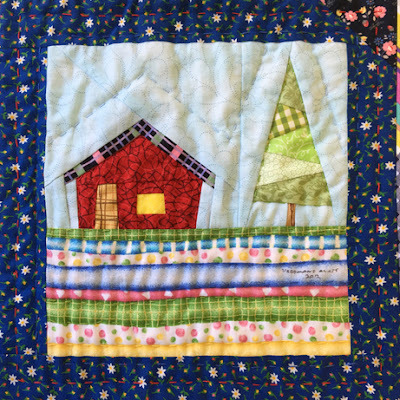 Sharon of Vrooman's Quilts made this picturesque scene. The stripes of colour in the garden work so well don't they. 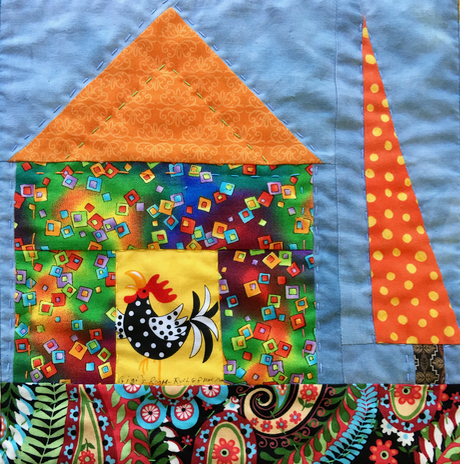 This house was made by Ruth of Gigi's Room I love the rooster singing his morning song. Some of the blocks were anonymous. 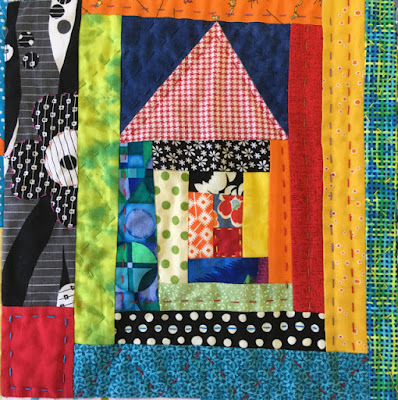 I started this house project as a record of my blog neighbourhood and so I think it's great that these blocks represent the anonymous followers of my blog. Those people who like to check in and see what I'm up to but are too shy to leave a comment. It's always fun to have some mysterious houses in a neighbourhood. Though if you know any of the makers of the following houses let me know and I'll add their names to the links. 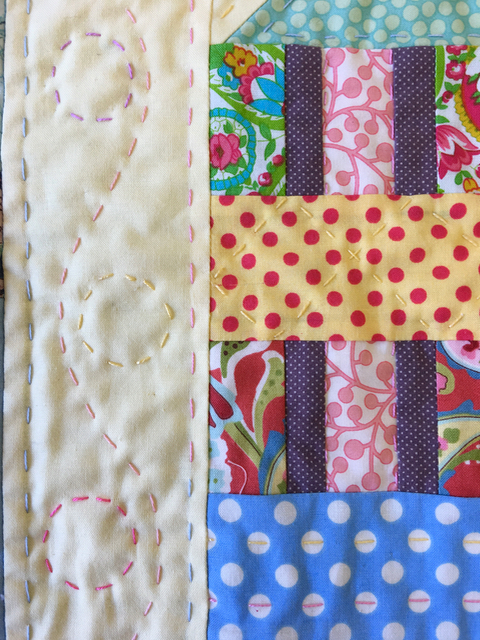 Finally I'll show you the blocks that I made for the quilt. This one had a lot more fabric surrounding it but I trimmed it down to fit. Making the quilt was a bit like doing a puzzle. I didn't like to trim other peoples blocks down but I didn't mind trimming mine. I had fun finding fruit fabrics in my stash for this block. Come on over and lets eat cherries, drink cocktails from pineapples and dance through strawberry fields. So there you go, in the next post I'll show how these houses all came together in a finished quilt. In the meantime here's some links to find out more about these colourful house makers. How cool are these houses!? So many individual touches and bright, happy colours! Hard to pick a favourite this week! You have certainly set up for a big reveal! Looking forward to the next post Rachael! I love how cheerful they all are. Even the anonymous ones fit the theme perfectly. I can't wait for the big reveal. I love Kellys block with the big flower - it is as fun as Kelly herself. I am looking forward to the big reveal. ALL the houses are gorgeous in their own way. I totally forgot what my block even looked like! 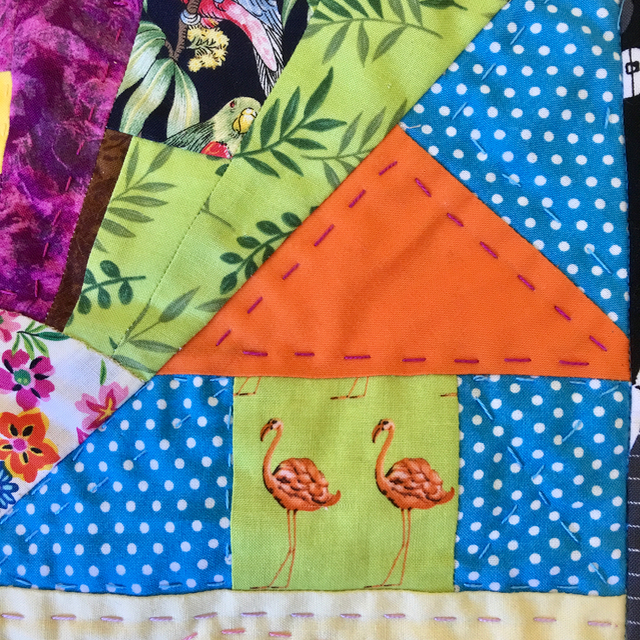 This is going to be an amazing quilt. The details you added truly made it yours! Lovely houses! 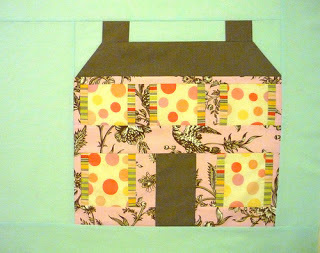 I am sewing a house quilt together at the moment. The Hellenic (Greek) Patchwork Guild had a QAL in 2015. I got 36 houses. Now it is the time to finish the quilt. I am nearly there. Just the quilting and binding are left to do. Fantastic, all of them! Wish I had known your blog then. I'll bet you had a ball putting all these together! So whimsical and cheerful! 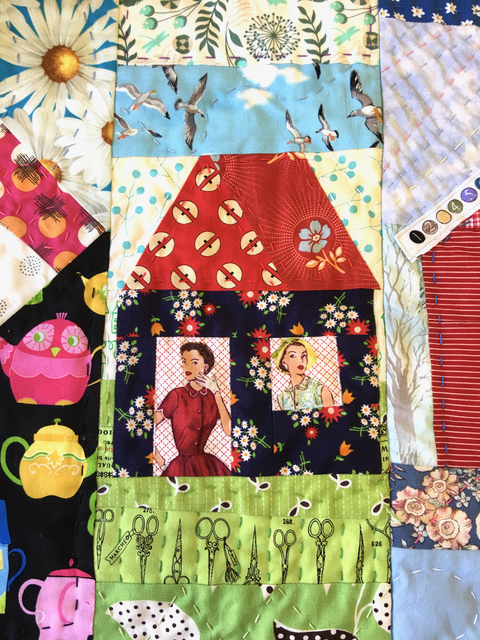 I think everyone should have at least one quilt that represents their sewing community/blogging community. And yours is truly wonderful! 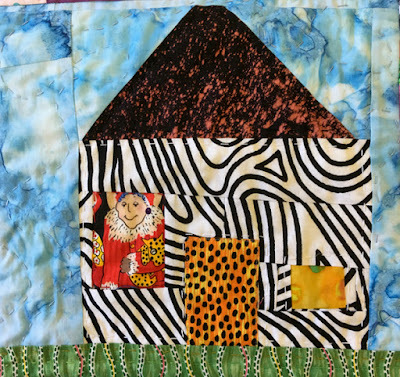 Can't wait to see all the pics of the whole quilt. Wonderful bright & cheerful houses! Love all the little details, and really looking forward now to seeing them all together! 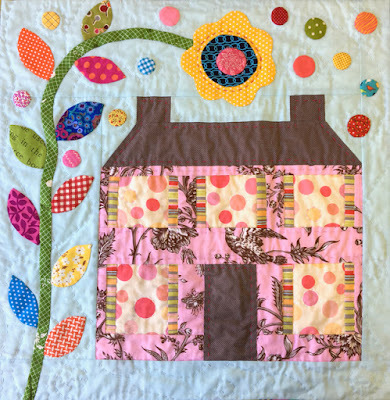 More delightful houses in your quilt. It will be fun to see them altogether as a unique neighborhood, village or town. Thanks for sharing these Rachael, seems so long ago that we swapped these blocks. 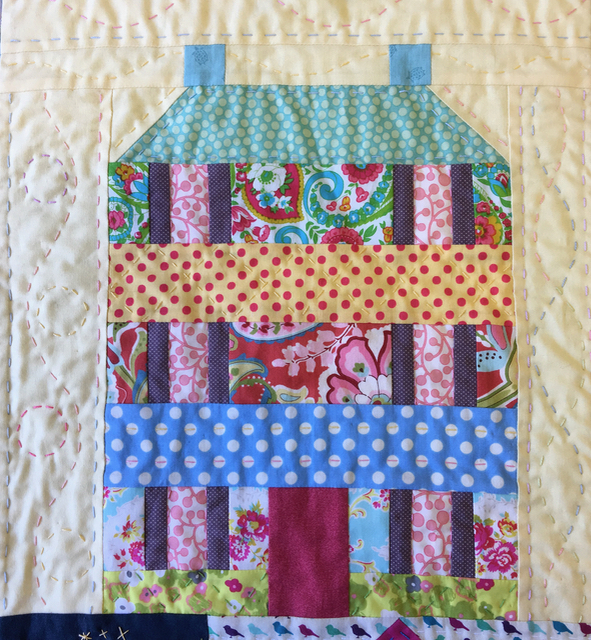 Love your stitching, can't wait to see what you have done with the blocks! Happy Sewing! These all are just fabulous! 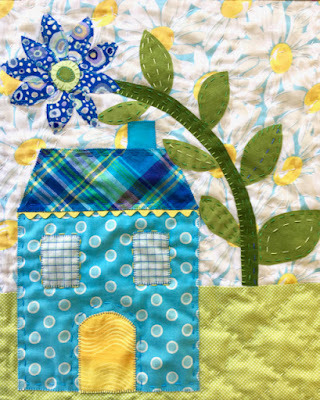 One of the toughest swaps I've ever sewn for was houses - - how to ever decide?!? I love seeing all the flowers and embellishments here and I'm waiting with bated breath to see the reveal!! Love the houses,and they ae so different. Like to see the result. Such great houses. 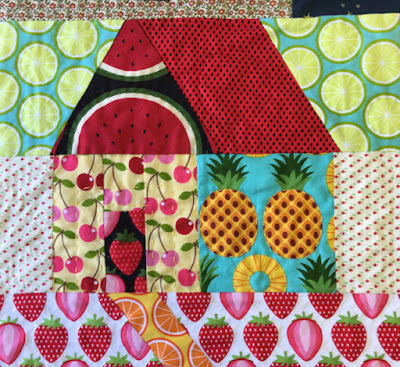 Love the strawberry fabric in one of your houses. I bought some of that fabric(the blue background colourway) from Spotlight and have loved using it. Might have th odd tiny scrap left to add to a Crumb Block! Can't wait to see photos of the finished quilt. Can't wait for the big reveal! Rachael, your Daisy neighbourhood is lovely, I would have loved to send you a block to join your others. I look forward to seeing the neighbourhood in its entirety when you do the final reveal! Some time ago I did a house swap along with a tree swap that I hope to marry the blocks in my own neighbourhood. Love the add ones and other fabrics you have teased us with. Love those big flowers towering over the houses. You've managed to bring a smile to my face again this dark and rainy morning! All the houses are wonderful in their own ways, just like people and houses in real life. This has been a fun way to appreciate each and every house and maker. New to your blog, though I imagine how I've missed it. What a fantastic way to celebrate your blogging community - I look forward to seeing your finished quilt. 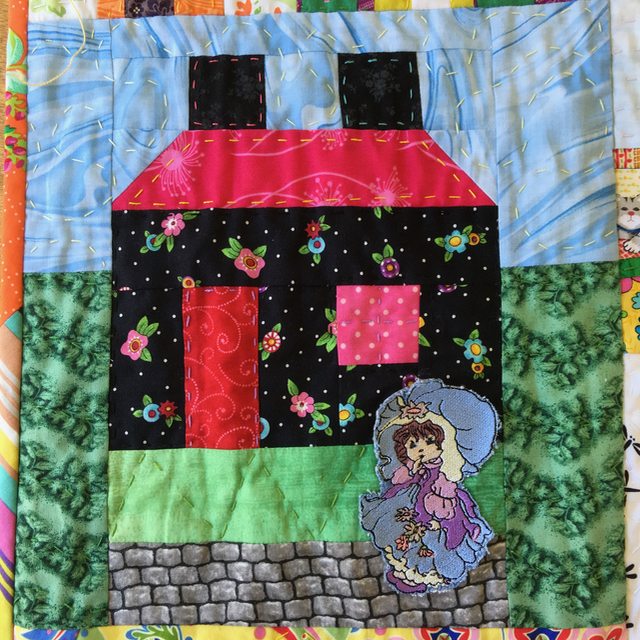 What fun seeing all the houses and how you have quilted them, by hand no less. Well done! 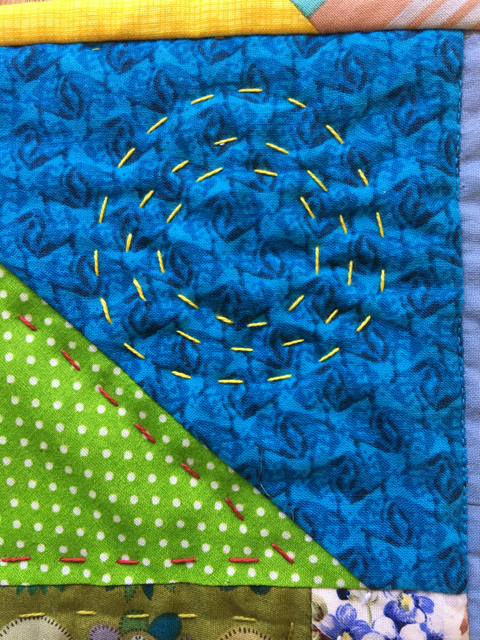 I am eager to see the whole quilt. Somehow I missed this post...Love of course...love..